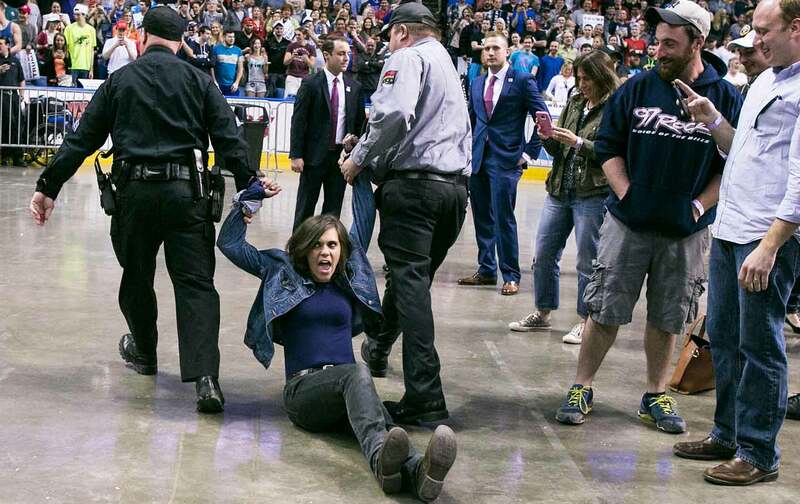 These protesters disrupted one of the biggest rallies of Trump’s campaign. But that doesn’t mean the protests aren’t important. As Trump travels the country during the never-ending Republican primary, he is continually activating dedicated resistance from activists who risk arrest, and worse, to deliver their message. That was certainly the case in Buffalo, where a large group of young residents, many of them black, engaged in civil disobedience aimed at disrupting one of the largest rallies of Trump’s presidential campaign. The city was the perfect stage for Trump. Local businessman Carl Paladino ran for governor in 2010 with themes now recognizable as Trumpian: deliberate political incorrectness, articulated rage at elites, and a hard-right platform. In Erie County, which contains Buffalo, he walloped Rick Lazio in the Republican primary with over 90 percent of the vote. During his warm-up speech for Trump in the First Niagara Center on Monday, where 11,000 people created a rock-concert atmosphere for the mogul, complete with an arena-wide wave, Paladino rehashed these same themes while exhorting the genius of Trump’s planned wall on the southern border. “That wall means so many different things to us. It means an end to our acceptance of a media thinking for us and telling us how to act. It means what we’ve watched for the past seven years in Washington is disgusting, and we’re tired of it, and we’re not gonna take it anymore,” he said. Paladino directed the crowd to turn around and face the media pen at the back of the arena floor. Trump promised a lot of wins—so much winning. “As soon as we beat Hillary Clinton, we are going to start, as a country, winning again. We’re going to win on trade, we’re going win with ISIS—we’re gonna knock the hell out of them fast,” Trump said, as the crowd roared. Amidst this tailor-made scene for Trump, on the eve of the New York primary, the protesters made their voices heard. Within one minute of Trump coming on stage, as he was bragging about making a billion-dollar offer for the Buffalo Bills in 2014, around 15 protesters locked arms and started chanting “No Trump, no KKK, no racist USA!” They locked arms and dropped to the floor, creating a difficult task for momentarily befuddled security staff. Erie County Sheriffs began clearing out the protesters, resorting to physical force after unsuccessfully pleading with the protesters to move. Trump had to momentarily stop his speech, berating the protesters and telling security to “get ‘em outta here,” but he had no choice but to resume his speech as the demonstration continued because it was taking so long to get the protesters off the floor. Officers were being directed on the scene by Erie County Sheriff Timothy Howard, who has personally endorsed Trump and suggested in 2013 that he would not enforce the gun control law signed by Governor Andrew Cuomo. Only two of the protesters were actually arrested, for reasons that remain unclear. Whitney Yax, a protester who was not arrested, spoke with The Nation outside central booking in downtown Buffalo as she waited for her friends to be released. All of the protesters arrested inside the arena were white. But their larger activist group is definitely not: It’s just that the non-white members decided to demonstrate outside the arena instead of coming inside to disrupt Trump’s speech. Instead, the black activists outside planned to sit down in front of the light-rail train leaving the arena after the rally. Police had forbidden parking within a mile of the First Niagara Center, so the train was the only way out for most of the attendees. “We were going to block the train so that Trump’s supporters couldn’t go home, to represent the fact that we can’t rest as people of color in the sixth-most segregated city in the country. We were going to sit and not let them go home until we could rest,” said Shaketa Redden. The plan was foiled by a strong Buffalo police presence that lined the train line with wooden batons and pushed protesters away from the tracks. The night before the rally, The Nation met with several of the activists who planned to block the train tracks. They were eager but clearly tense about what might happen the next night, and described frustration with a lack of activism and protest in a city rife with problems. They said many of their young friends had left, and noted that the average voting age in one of the majority-black City Council districts in the city is 61.